The machines we supply are completely rebuilt and supplied with a serial number and fully comprehensive parts books (in fact, just as you would expect of a new THWAITES dumper). 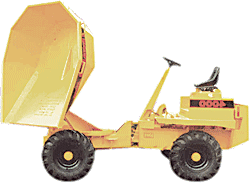 Our dumpers are shot blasted, resprayed in manufacturer's original colours (or colour of your choice); all decals, instruction plates, and transfers replaced, and fitted with brand new quality tyres. If you want a THWAITES dumper which looks and feels 'new' and is ready for a lifetime of hard work then please get in touch.